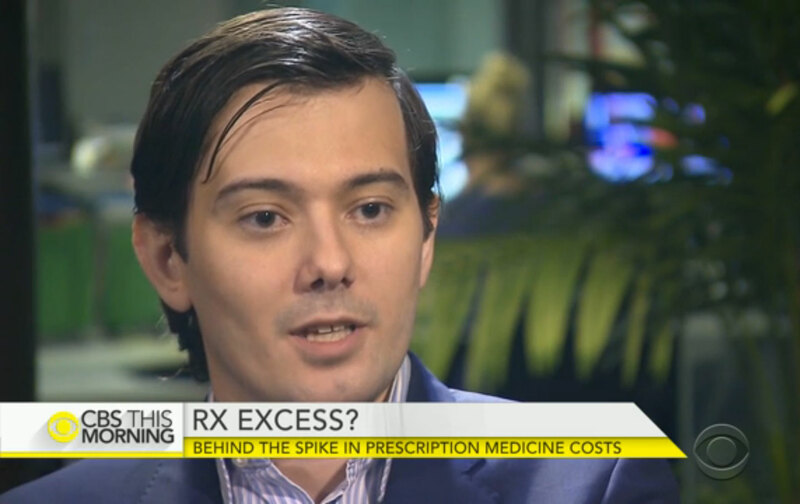 Americans were outraged over his 5,000 percent price hike of a life-saving drug. They should see what Big Pharma has in store. This week, the Internet’s object of hate was Martin Shkreli, the 32-year-old hedge-funder turned CEO of Turing Pharmaceuticals who jacked up the price of Daraprim, an old drug used to treat parasitic infections in the immunosuppressed, from $13.50 to $750 per pill. At first, Shkreli seemed to relish the controversy, taking to Twitter and various talk shows to defend his actions. But his tone-deaf justifications and brash, antagonistic tweets only fueled the backlash. Shkreli was denounced on Twitter as “human garbage,” “a monster,” and “a sociopath.” Politicians from Hillary Clinton and Bernie Sanders to Donald Trump called him out, and even the Pharmaceutical Research and Manufacturers Association of America (PhRMA) disassociated itself from him. Within a few days, Shkreli vowed to reduce the price of the drug—although that did not stop Internet activists from doxing Shkreli by posting his OK Cupid profile, home address, and phone number. It’s tempting to declare that the Internet triumphed over Shkreli and, in turn, the pharmaceutical industry, but in reality the whole episode is only a tiny skirmish in a long-running battle that drug companies have been waging against the American people. Sadly, the American people are losing the fight—badly—and haven’t paid much attention to the hosing they are getting. I am alive today because of drugs developed by US pharmaceutical companies. Since 1996, I’ve been taking antiretroviral therapy to keep HIV in check and will likely live to die a few decades from now from something other than AIDS. I understand the benefits—in a deep, personal sense—of research and development on new medical products. But being grateful for the pills that keep me alive doesn’t mean I owe the industry unquestioning allegiance. For all the good they do, the US pharmaceutical industry is shafting the American public in two ways: with costly consequences and with potentially deadly effects. The US pays the highest drug prices in the world, spending about $1,000 per person per year. The United States pays the highest drug prices in the world. According to Valerie Paris, an economist with the Organization for Economic Co-operation and Development (OECD), we spend about $1,000 per person per year on drugs, which is about 30 percent higher than Canada. We spend over 50 percent more than what European countries like France and Germany spend per person. These inflated costs are passed on to consumers, in the form of co-pays and healthcare premiums, and to taxpayers, who subsidize healthcare through public programs like Medicaid and Medicare, the Veterans Administration, and the Indian Health Service. The justification for these high prices is always that this is the cost of innovation, something Shkreli also cited in defense of his 5,000 percent price hike. New drugs tomorrow require private investment today. However, this claim is almost entirely unverified. Most companies refuse to disclose their research-and-development costs to the public and ask that we take it on faith that the massive profits they receive (between 10 and 43 percent for the largest pharmaceutical companies) are being plowed back into generating new medicines. It’s high time to call the companies’ bluff—let them show us the data on the investments in all their drugs on the market and let us make a judgment based on the evidence. In fact, one California state assemblyman, David Chiu, tried to pass a bill to require this kind of transparency. The industry killed the bill in Sacramento. The policy prescriptions for addressing high drug prices are numerous. Clinton floated some this week, including letting Medicare negotiate drug prices, ending tax breaks for TV drug ads, and requiring companies to dedicate a set percentage of profits for new research. PhRMA immediately slammed her proposals as a threat to innovation and new drug development. Expand utilization of existing generics by further incentivizing their use or further penalizing the use of brand-name versions. Expedite the entrance of generic versions of expensive medications to the market by shortening the lifetime of patents on brand-name drugs, or by buying out patents from the originator companies, as Harvard’s Michael Kremer suggested back in the late 1990s. Set thresholds for the cost paid by public and/or private payers for classes of drugs that are bioequivalent or therapeutically equivalent—that is, they are either the same chemical entities produced by different drug-makers or drugs that act in the same way for the same condition—based on the lowest price in a given class. Use cost-effectiveness analysis to look at the bang-for-the-buck, the increase in quality adjusted life years (QALYs) offered by a drug at a given cost, and set a threshold above which the cost for a QALY is too expensive to justify. The National Institute for Health and Care Excellence in the UK has been around since 1999 and has made recommendations to the National Health Service there on which drugs to cover as part of its formulary using this approach. Despite these and other proposals, many of which are already implemented in other countries, the drug lobby has killed every attempt to address the exorbitant price of drugs in the United States over the past few decades, including in the negotiations over the Affordable Care Act and Medicare Part D. In the partisan world of Washington, DC, there is one thing both parties rely on and cherish—the largesse of the pharmaceutical industry. Until we address this political reality, we won’t see these mechanisms being championed in any serious way anytime soon. In fact, drug companies are pushing ahead with aggressive measures to further deregulate the industry and neuter the Food and Drug Administration, which approves new medical products. Since the thalidomide tragedy of the 1960s, the FDA has been able to require that companies show that their drugs are both safe and effective before putting them on the market. That’s hardly too much to ask for from clinical and public-health perspectives, and from the consumer’s point of view as well: We pay a lot of money for these medicines, they should work as advertised and be safe to use. However, even though the FDA approves 96 percent of the drugs that come before it nowadays, the industry is pushing legislation to water down the requirements for drug approval to make it even easier to get on the market with less and less data. The 21st Century Cures Act just sped through the House of Representatives this summer, and a similar bill is likely to make it through the Senate within the next few months. The legislation is touted as being about innovation—there’s that word again—but two former FDA commissioners, David A. Kessler and Margaret Hamburg, along with leading academic experts on the FDA, have criticized the bill as being a Trojan horse and a threat to the FDA’s core mandate to keep unsafe and ineffective drugs off of pharmacy shelves. Meanwhile, in the courts, conservative think tanks like the Washington Legal Foundation and their Pharma allies are pushing the free-speech rights of drug companies, which would allow them to make claims about their products without sufficient evidence to prove that they are true, as long as the claims are not proven false or misleading. Two of these cases have been successful this far, and should the Supreme Court take up a similar case and rule as the lower courts have, the 1st Amendment may give drug companies the right to get a drug approved on the narrowest of indications by the FDA and then market the hell out of the drug for everything else as long as the claims aren’t shown to be patently untrue. With less and less evidence being required for FDA approval, and with wider and wider latitude in what companies can claim about the drugs they market, we may be returning to the pre-thalidomide days, when opening one’s medicine cabinet was akin to a game of Russian roulette. In a few years, we’ll be living, and dying, with greater uncertainty about whether the drugs we put in our bodies are actually safe and actually do any damn good. When you think about Martin Shkreli is this light, you realize he is small fry. Was what he did stupid and greedy? Yes. But the bigger threat is still out there, and with no significant opposition to stop Big Pharma’s march forward. We all may have been mad at Martin Shkreli, but what drug companies have in store for us scares me to death. Gregg GonsalvesTwitterGregg Gonsalves is the co-director of the Global Health Justice Partnership and an assistant professor of epidemiology at Yale. He is the winner of a 2018 MacArthur fellowship.